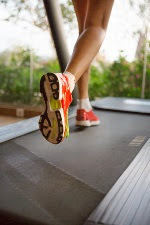 This study tested experienced runners using a special antigravity treadmill that can artificially reduce body weight by supporting the runner at the hips. This made it possible for the study participants to run faster than would be possible on a regular treadmill. In each eight sessions over four weeks, runners trained on the antigravity treadmill performing intervals at “higher-speed.” In effect, their body weights were reduced by 10 percent during these running bouts – enabling faster than normal running paces. After this training, their performances increased similarly to runners doing the hard work on a regular treadmill at a similar intensity (only the speed and body weight differed.) Interestingly, the runners felt it was easier on the antigravity treadmill, although they were working just as hard. The authors referred to this training method as “overspeed” running. The findings introduce new training possibilities with performance benefits and, at the same time, reduce effort felt by the runners. This entry was posted in ACSM, Articles, Performance, Running, Science, Sports, Training by sportsmedicineweekly. Bookmark the permalink.